Do you notice slight differences in the header concerning Israel between the US version and the UK version below (see arrow)? Yes – the US version suggests that Israel will build one thousand two hundred new settlements (on the West Bank). A more rational editor in the UK, apparently realizing that even the Netanyahu’s government would be hard put to cram 1,200 new settlements into the West Bank, chose instead to use an almost equally misleading term of “settlement units” (aka – “apartments”). 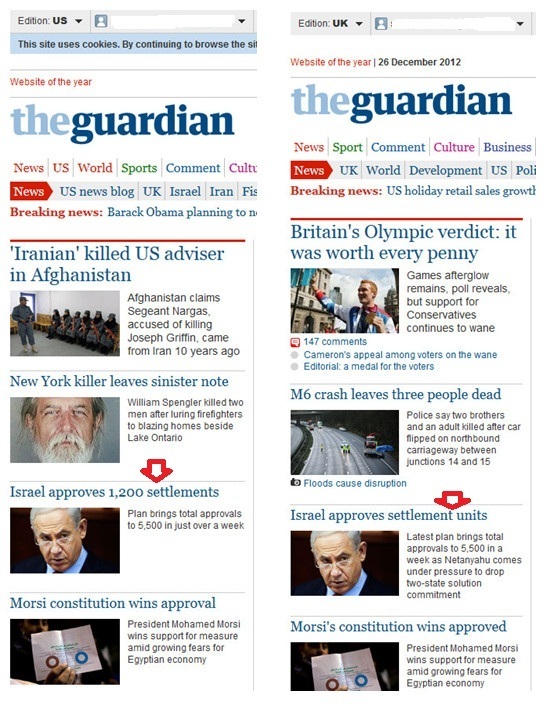 The error in the US header and the ambiguity in the text of the article indicate Guardian group-think about Israel’s so-called “settlement building” – a narrative which ignores the fact that there has not been a new settlement of any significance in the last four years, other than a couple of swiftly removed caravan or tent efforts. The idea of 1,200 new settlements (that is, 1200 entirely new communities/towns across the green line) seems quite feasible to such writers and editors, indicating also that they don’t know too much about the size or geography of the West bank. Thus, their decision to characterize any home built for Israelis in the West Bank not as “apartments” but, rather, by using a new term in alignment with their broader view – a “settlement unit”. It’s possible that Sherwood, who seems to be gradually gaining insight into what makes Israel tick – an understanding, it seems, that accelerated markedly after a couple of rockets landed near Jerusalem, where she is based – actually acknowledges that potential occupants of these “settlement units” are just people for whom homes are being built, not cartoon characters drawn by the Guardian’s Steve Bell who live in “settlement units”. If Palestinian leaders refuse to sit down and work with the Israelis in good faith to reach an agreed set of borders between Israel and a putative Palestinian State, Israel is giving notice that it will not sit and wait for the phone to ring. Calling apartments Israel builds (while the PA refuses to negotiate any borders) “settlement units” will not make the apartments any less home to more and more Israelis, as Sherwood, at least and possibly alone among Guardian staff, may now understand. But when will the Palestinian Authority get the message? CiF contributor asks: Does Israel depend on the support of right-wing antisemites? “Settlement units” sounds so so Soviet. Hilarious. I wouldn’t be too surprised if someone like Sherwood gradually becomes more and more pro-Israel the more time and personal experience she actually has of what the Israelis are up against day after day. Perhaps experiencing a couple of bombs from her Palestinian heroes a block or two from where she is based will do the trick, or perhaps having a journalist friend killed in one of their murderous outrages. I am afraid that I don’t share your optimism. She has probably been phobically inducted against showing any support, intelligent analysis or indeed telling anything that even approximates to the truth without putting al-Grauniad’s spin on it. Should she bend even a little she will be yanked out of Israel so quickly that she won’t be able to catch her breath. A preposterous gaffe, of course. i.e. any excuse to continue expanding Israel’s settlement building in the West Bank. The election capaign of some parties evolve around such questions. Meretz for example want to scrap the Oslo agreement altogether and focus on a new agreemtn focusing on the Arab offer. But why does Likud insist on more settlements? That policy reaks of a Greater Israel – not a 2-state solution. I think the recent Peres speech row speaks volume about certain right wing Israeli’s mentra. Bibi could cram upto 1201 settlements in the west bank. These new Ant farming communities will be built around the Jordan valley where they’ll be trained in spying for Israel before being sent to their missions to slowly demolish the Iranian neuclear facilities and the Nile Dam to bring the Egyptians to new disarray after the Zionists’ 21.12.12 plan to destroy the world by inviting Alian party crashers failed to materialise. To the Saudi Arabian government readers this is sarcasm so no need to stock up on Ant spray.